The Mines and Geosciences Bureau Regional Office No. XIII participated in the Training on Managing Information Communication Technology (ICT) Services in Government Information Technology Infrastructure Library (ITIL) Framework on September 26-28, 2018 at the DICT Building in Diliman, Quezon City. The training was conducted by the Department of Information and Communication Technology (DICT) Central Office. It was participated by National Agencies, Local Government Units and stakeholders from the private sector. Technologies on ICT Service Management. The aforesaid topics were discussed by Mr. John J. Macasio. 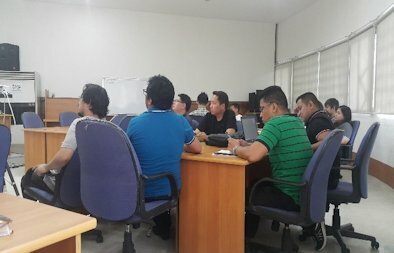 These topics centered on how stakeholders manage ICT computer architecture services properly within the guidance of the government mandated agencies such as the National Privacy Commission, Department of Justice – Cybercrime Division, MITHI, IGov and of course the DICT itself. Based on the ITIL framework presentations, the ICT services of institutions/agencies in the Philippines run/manage technically instead of governance, that is why the participants are enlightened on issues which surfaced in the past and present times regarding government dealings with ICT services in the Philippines. During the discussion and storyline on manning ICT services, it was pointed out that the respective institutions/agencies must undergo impact assessment with regard to their procurements, records inventory, data privacy, cyber security, and other IT related services. As for citing procurement process as far as Provincial/District/Regional Offices is concerned, the Information System Strategic Plan (ISSP) is the only methodology on procurement not to mention the backbone which is the Enterprise Architecture (EA). The Enterprise Architecture Framework defines the institutions/agencies’ needs from the manpower resources up to the end-user/client services that provide principles and practices by way of layers, models, domain, matrices and diagrams for making systemic design decisions for sustainability. In that regard, a certain agency which has proposed a special ICT project will undergo thorough deliberation with respect to the EA Framework. The end-product of the said ICT impact assessment will serve as the best practices and standards of agencies/institutions which are ICT-related International Standard Organization (ISO) and International Electrotechnical Commission (IEC) standards particularly the ISO/IEC 38500 (The Corporate Governance of Information Technology), ISO/IEC 20000 (The Information Technology Service Management) and ISO/IEC 27000 (The Information Security Management System). An Information Technology (IT) Service Capability Maturity Model (CMM) Questionnaire was given as a sort of guide/process on how the participants will assess their respective agency’s/institution’s IT management governance towards ITIL framework. Finally, a sideline discussion on Data Privacy Protection (DPP) took place. The National Privacy Commission (NPC) wants all government agencies and institutions to be aware of, comply with, and properly regulate Data Privacy Protection.